It’s amazing how time gets away from you when you operate multiple blogs and run your own business. Since we’re coming up on the feast day (December 12) for Our Lady of Guadalupe and today’s the feast day of St. Juan Diego it’s only appropriate that we honor her with a post and her picture. 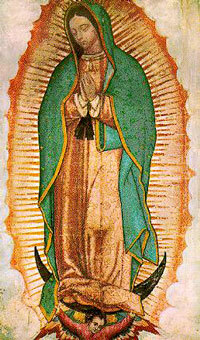 I do find it interesting that the website for the Basilica in Guadalupe is only in spanish though. I wish it was in english!